This fresh new bundle from Design Cuts has been designed specifically for designers who want to kick start their freelance career. It’s an essential starter kit that will equip you with the knowledge of how to run a successful design business, including advice on project contracts, pricing your services, and finding clients, along with a healthy collection of premium quality tools you can rely on for years to come. It’s headed by the popular Drawn to Business strategy guide, which is complemented by a range of company proposal frameworks, mood board templates, resume layouts, numerous UI kits, and a variety of social media graphics packs. The regular value of all the contents totals at $4,202, but a massive 99% discount cuts the price tag to just $39. 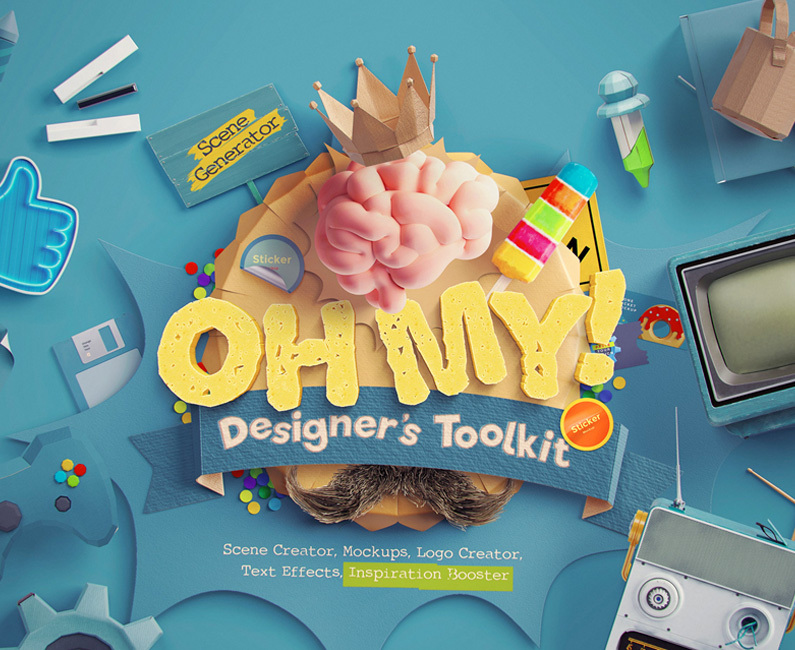 At less than the average designer’s hourly rate, this toolkit will bring you an enormous return on investment! The Professional Designer’s Time-Saving Toolkit has been built to help freelancers or aspiring designers optimise their precious time, work fast & smarter, and land their dream design projects. It’s a useful combination of knowledge and resources that will give you a head start in your new career. Each item is a comprehensive best selling product alone, so this is a great opportunity to acquire a huge collection of sought after tools at a fraction of their regular value. With over 100 hours of material, the Drawn to Business package is a full guide to building a thriving design firm by Go Media’s William Beachy. It contains proven techniques for maximising your profits, landing big name clients and methods to growing beyond freelancing. It’s a mix of PDF ebooks, videos and templates that cover every aspect of working in the design industry. Make a strong and persuasive project proposal with a ready-made template that sets out all the important details in an attractive layout. Customise the contents, then adjust the text, colours, styles and images to have a print-ready brochure file available on demand. Gathering inspiration is a crucial first step of any project. 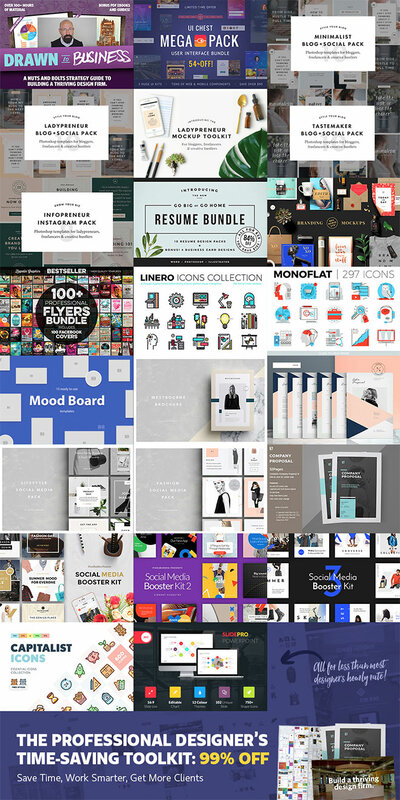 These ready-made mood-board templates allow you to quickly and easily present your ideas to clients or colleagues and get the project moving! If you’re looking to get a foot into the design industry, nothing stands out more than a fully branded resume, cover letter and business card. This collection of 10 stylish designs can be customised in Photoshop, Illustrator or Microsoft Word. Standing out on social media is a must in this digital age. 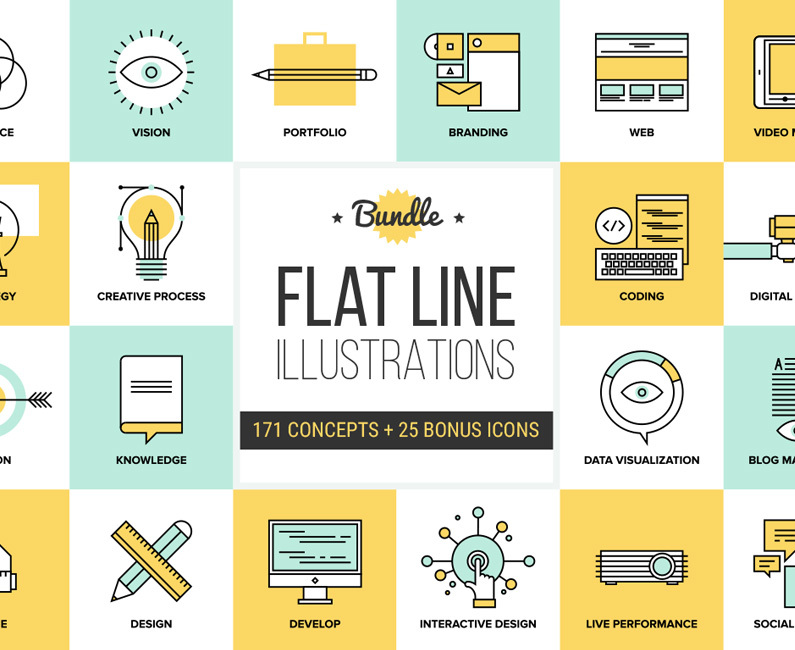 Included in the bundle are a range of social media packs that contain shareable graphics, blog headers and quote templates to get you noticed on Pinterest, Twitter, Facebook and Instagram. This is just a small taster of what’s included in the full Professional Designer’s Time-Saving Toolkit. There’s also a range of Powerpoint presentations, flyer templates and icon packs, as well as even more social media booster kits, mockup packs and design templates to add to your resources library. Be sure to browse through the full overview to realise the depth to which these products go. 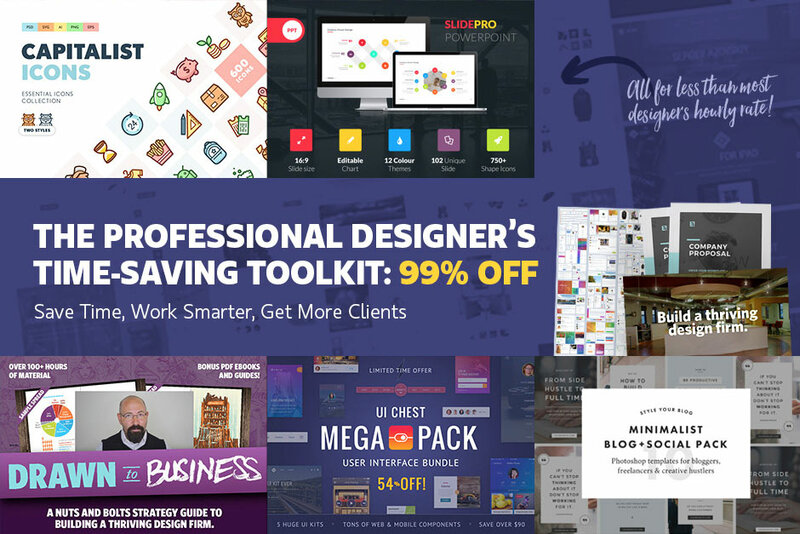 This limited time offer of 99% off provides an incredible opportunity to acquire a variety of best selling tools that will help you progress in your design career. I ordered the Designer Toolkit and payed via Paypal. The problem is my work changed our emails and the download link did not get forwarded to my new email. can you help with that? I just now updated on your site to the correct email. Thanks! Never mind, got it! GREAT Deal!!!! Awesome deals. They will help designers a lot. Love this offer! Thanks Chris for showing this post here! As a professional graphic designer designer, I’ve to say, it is fab deal for every graphic designer. Hi Kate, I’m glad I could help! Great article and awesome effects, I like the most Embossing,letterpress & Blind Debossing. Hi! It’s great you liked the article!